Click the image above to order a custom USA and union-made shirt, stitched from a generous heavyweight cut. The shirts are also pre-shrunk and 100% cotton. 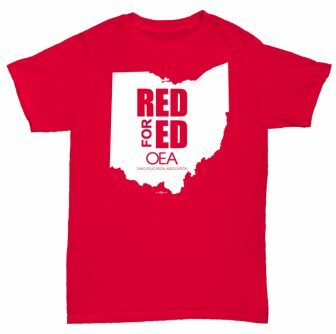 We’re calling on all Ohio educators and support professionals to wear red every Wednesday! Join your peers around the nation to raise our collective voice on behalf of our students, our communities, and our profession! Take the National #RedForEd pledge!